“I was personally very, very excited and very, very nervous, about our very first chapter meeting,” President Maria Haseem said at the chapter's first meeting earlier this month. Founder Samira Maddox started the sorority three years ago at the University of Texas at Dallas because she was looking for a place to fit in and have a full college experience. She was born in Somalia, grew up in Canada and has been living in the U.S. for 10 years. But, she says, it was difficult to find a group that matched her unique qualities. The sorority launched two new chapters this year – one at the UT-Austin and a joint chapter at the University of North Texas and Texas Woman’s University. Each campus held rush week last month, and now more than 60 young women are calling themselves sisters of Mu Delta Alpha. But Maddox said getting here wasn’t easy. When she decided to start MDA, she received a fair amount of pushback. Although UT-Dallas supported her efforts, it was difficult to find a faculty adviser. Even after she finally found an adviser, there were other challenges ahead. While the sorority's first rush brought in more than a dozen young Muslim women, some worried it would be a stereotypical Greek experience. A strict adherence to the Muslim faith means no alcohol, so many of those first pledges changed their minds. Because of that misconception, only three people joined MDA’s inaugural pledge class. But, after a couple years at UT-Dallas, people started to better understand what the sorority was all about. It’s less social and more professional – it books motivational speakers and organizes career workshops – but it’s also built around members’ sense of Islamic identity. Haseem said that connection to identity is what drew her to the organization from the very beginning. One of the sorority’s main goals is to find successful Muslim women and make them accessible to the sisters. It achieves that, in part, through its speaker series. “Essentially I really wanted … mentors that understood the types of struggles that Muslim women go through, and Muslim girls go through as they grow up,” Haseem said. It was that focus on young Muslim girls that sparked the idea for the sorority's first annual event: the Young Muslimahs Summit. 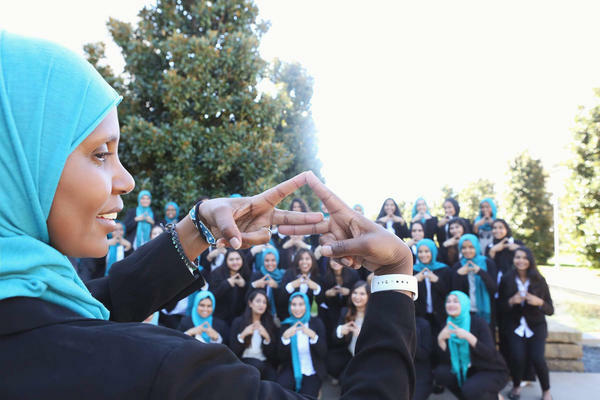 Back in April, the sorority held a conference in Dallas for around 200 young Muslim women, offering workshops tackling topics such as body image, bullying and education. And it brought prominent speakers, like Bilqis Abdul-Qaadir, the Muslim-American basketball player who was banned from playing with her hijab by the International Basketball Federation. She fought the ban, and, just this year, she won. Maddox says it's stories like Abdul-Qaadir’s that she hopes will shatter the common misconceptions of Muslim women. Lina Barakat, a sophomore at UT-Austin and one of MDA’s newest pledges, said she feels the organization gives young Muslim women a chance to develop into role models. When that happens, Barakat said, she’ll be right there to extend a hand.